Extensively researched, immaculately designed, and endlessly fascinating, the Pitchfork People's List genuinely aimed to take the power of criticism away from the pointy-headed critics and put it into the hands — and ears — of the people. The idea, of course, is to document the "thinking people's music" — i.e. the music that helps intellectually define an era — that Pitchfork lists aim to tackle. The hallowed End Of Year lists are passed around from blog to blog, and when the editors at The Fork took on 2010 with "The Best Albums Of The Last 10 Years", readers were reminded what a strange musical experience the aughts were. So, ostensibly, we should be pleased with this democratic approach to the hallowed music list. Except, this writer is not pleased. Not because it isn't beautiful (it is) or accurate (not a lot of complaints, here) or lacking thoroughness (they covered their bases), but because the entire spectrum seems rather, well, male. First and foremost, this applies to the artists represented on the list. 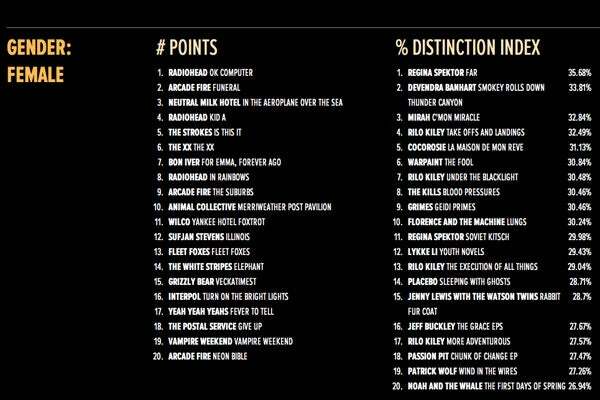 We tallied things up, and of the top 200, only 28 were "female-fronted" bands, and that's based on a loose criteria that includes Broken Social Scene for their frequent female collaborators and The Arcade Fire/White Stripes for the husband-wife duo aspect. For the statisticians among us, that's about 14%. But even beyond that, the "representative sampling" also turns out to be skewed to men. A whopping 88% of those polled were dudes. Of course, according to Quantcast, the majority of Pitchfork readers are men, so it might be safe to assume that, with more male readers the poll received more male additions. But even that doesn't seem quite right. Women account for 37% of the pub's readership — not the 12% represented here. That feels like a pretty significant misrepresentation to us. However, thanks to the clever way the list is designed, it is possible for data-nerds to dissect the available info by gender. And when you take out the polling bias favoring men's responses, the results are surprisingly the same, with a couple outliers, as seen below. A few more females appeared, like Regina Spektor, Cocorosie, and Lykke Li. 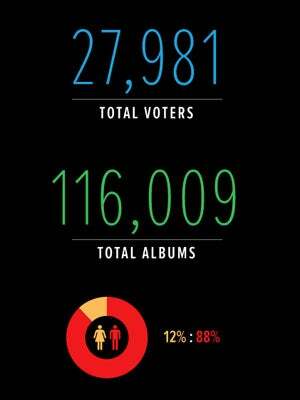 So this begs a two-part question: If more females had been polled, would more female artists appear on the list? And, more importantly, is Pitchfork's audience mostly men because Pitchfork's critical darlings — the artists who ostensibly comprise "indie music" — are mostly male? After coming under fire for its gendered approach to the People's List, Pitchfork writer Eric Harvey pointed to the High Fidelity conundrum: Men like to make lists. In High Fidelity (talking now about the movie, and not the book), John Cusack and Jack Black spend endless hours coming up with (actually very good) lists like, Songs You Want Played At Your Funeral or Top 5 Track Ones, Side Ones. To suggest that "definitive" list-making is a purely masculine thing would be entirely untrue — but it may be more gendered than we think. In this week's Mother Jones, author Rebecca Solnit talks about Men Explaining Things. As an accomplished author of political and anthropological books, it is safe to say she is an "expert" on a great many things, but still, men insist on imparting their wisdom to her. She writes, "Men explain things to me, and to other women, whether or not they know what they're talking about. Some men…Every woman knows what I'm talking about. It's the presumption that makes it hard, at times, for any woman in any field; that keeps women from speaking up and from being heard when they dare; that crushes young women into silence by indicating, the way harassment on the street does, that this is not their world." Maybe Explaining Men (a term we are borrowing from Solnit) aren't much different than list-makers, but the idea that one has a definitive opinion that can be quantified might have something to do with her notion of Men Who Explain Things. Another Pitchfork writer, Lindsay Zoladz, points to the fact that sometimes women don't feel secure enough in the depth of their knowledge, quoting another gal who writes, "I really like this one Mission of Burma album, but I am hesitant to bring that up to a man, because I don’t listen to ALL of their albums." Without a deep knowledge of Mission to Burma, do we have a right to say Vs. is the "best album ever"? Discussing ideas as being more or less masculine/feminine is tricky and problematic. But it might be that Explaining Men, the High Fidelity Robs of the world, have a more structured way of looking at favorites and bests, while female music fans tend to be, for lack of a better word, more introspective. The idea of the Best Albums From 1996 to 2011 sounds rather daunting, and like a cold, statistical task, and Lindsay Zoladz points out that the reason why her lady friends didn't make lists was because, well, they had better things to do. Additionally, what are missing from the list, notably, are the major pop hits. Kanye West, Robyn, and Jay-Z all appear, but the critically acclaimed (by Pitchfork itself, in fact) 4 by Beyoncé is missing, as is Gaga's The Fame Monster, or Adele's 21 (all of which, given their popularity and cultural impact, will probably have a larger imprint than, say, Panda Bear's Person Pitch). It might not be sufficient to say that popular music is the realm of the female while "thinking man's indie" is for, well, thinking men. 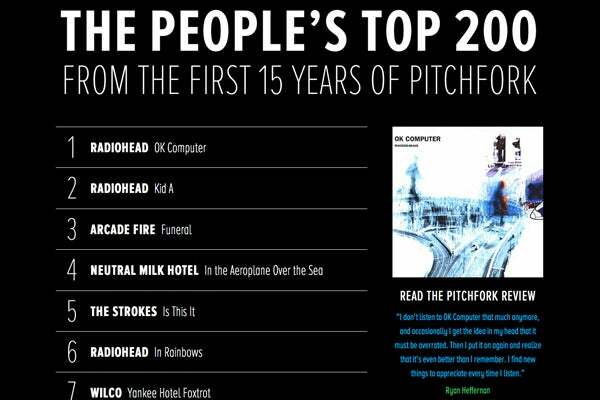 But Pitchfork's male-leaning statistics surely show that, hey, dudes read Pitchfork. Could it be that the world of indie rock, which prides itself on historical accuracy, tracing musical lineage, and oceanic depth of knowledge is filled with Men Explaining Things? While that doesn't begin to explain the female fascination with pop music, perhaps it helps — and also starts to address both the lack of female artists and participants on this list. Either way, perhaps this isn't a Pitchfork problem, but a criticism-and-explaining-and-quantifying problem. That, and, the omission of Under Construction is nearly criminal.